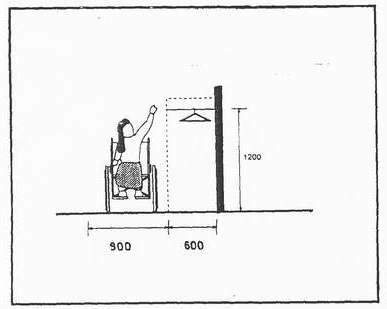 Storage space of various kinds (shelves, wardrobe rails, cupboards and drawers) should be appropriate height and depth reachable by people in wheelchairs. A recessed space should be provided under storage units to accommodate the footrests of a wheelchair. Cupboard and drawer handles should be a shape which may be easily grasped by a person with limited gripping or pulling strength. Lockable drawers should be provided for each occupant in residential institutions. 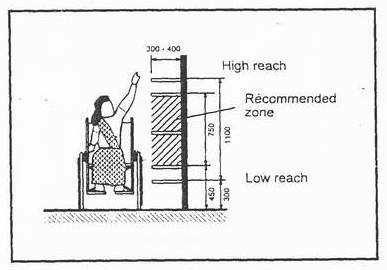 A refrigerator should be at a suitable height and depth for easy reach by wheelchair users. Sufficient floor space should be provided for wheelchair users to manoeuvre around open doors of cupboards and refrigerators. Figure 5.1a : Storage Space. Figure 5.1b : Wardrobe (Fixed Type). 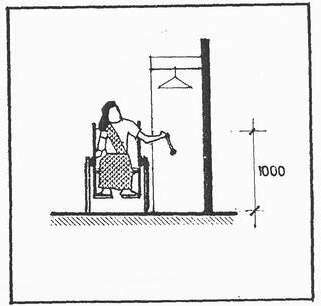 Figure 5.1c : Wardrobe (Lever Type).